After our small breakfast at the hotel, we embarked on the four hour drive to our hotel or ‘Homestay’ in Agra. Once arriving, picking up our guide for Agra and settling down on a cup of Masala Chai we headed to the Taj Mahal car park where we took what looked like a large electric buggy the last 1km to the Taj Mahal as fuel powered cars are not allowed within a certain area for pollution purposes. On arrival, the guide told us we were entering through the east entrance which led to a rather impressive entrance called the great gate or a the guide put in a part of the Taj Mahal’s beauty. This entrance was built to serve a interesting purpose, to hide the Taj Mahal from view until through it apart from through the gateway through which you could only see the Taj Mahal’s entrance. Like, as the guide put it, when a Muslim lady covers her whole face apart from her eyes with a burqa as after all it was built for the wife of the fifth mogul emperor who was Muslim. Consequently a mosque was built on the left side or the west side of the Taj Mahal and for symmetry reasons a guesthouse on the east side. After entering Nilay, Mama and I had our first ever glimpse of the Taj Mahal, one of the 7 wonders of the world and a truly breathtaking sight. 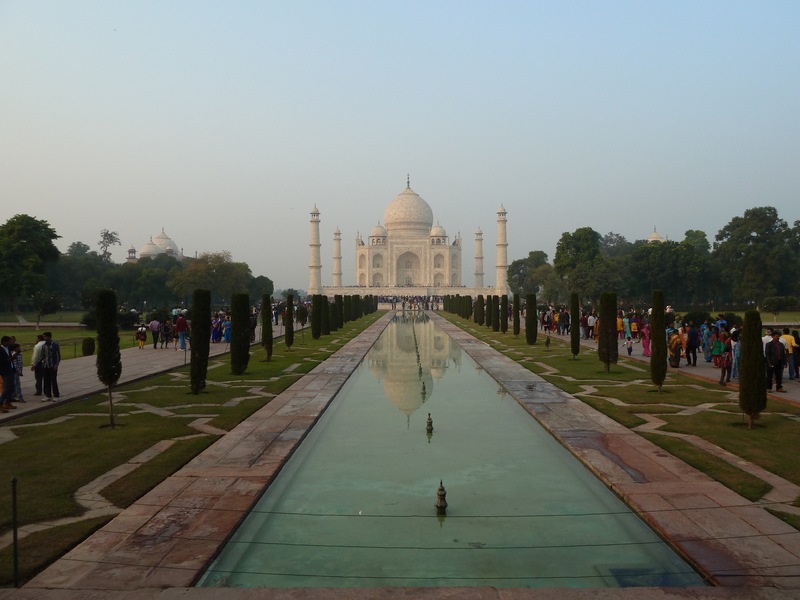 We then left Papa just inside the entrance, as he wasn’t feeling very well (we think he had ‘Delhi Belly’), and started heading around to the Taj Mahal itself through the gardens. After skipping a few queues, our guide being let through by the staff us with him, the guide gave us a lecture on the gemstones inlayed in the marble. He told us that it used to be with precious gems as well but they were replaced due to risk of theft. Finally we went inside were we saw the tombs of the fifth mogul emperor and his second wife and were harassed by the police officers and staff as they wanted us to get out so they could let the next wave of people in. After exiting and seeing the full extent of the queues we’d skipped we headed to Lady Diana’s bench were we had our photos taken before reuniting with papa and getting our pictures taken there with him. Our wonderful Taj Mahal visit was brought to an end with a electric buggy ride back to our drivers car. From there our guide persuaded us to go to a factory where they make things with marble and inlayed gems which was fascinating although the person who took us through just gave us the same lectures and tried to sell us something with the upsides in learning that the people working had ancestors who helped doing the art in the Taj Mahal. After this interesting day of experiences we settled down to a lovely Thali meal while mama ‘socialised’ with the others in the ‘home stay’ including the owner Mr. Burman.